Kells beach is in small harbour with pier. There are beautiful sights of the Dingle Peninsula. The whole area is rich in flora and fauna and is both a Natural herigate site. Kells is an idyllic harbour on the northern coastline of the Iveragh Peninsula. Kells is located approx. 11km north of the town of Caherciveen off the N70 – Ring of Kerry Road. 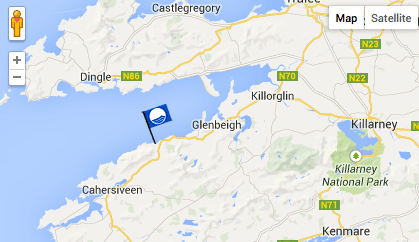 Located on the Ring of Kerry. 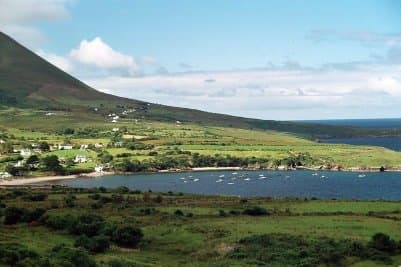 Ideally situated between Glenbeigh and Cahirsiveen, Kells beach shows the unspoilt nature of South Kerry. The beach is located close to a little harbour, and loads of fun can be had here. A wide range of flora and fauna surrounds the beach. The beach is quite private and is much quieter than other beaches, that are found in the area. This beach is not lifeguarded but lifesaving equipment is available, and is quiet safe once supervised by an adult. Kells beach is popular with swimming..